The science of SEO demands that we utilize keywords in everything that we do. Simple keywords with high search volume are always tempting, but they come with a caveat: the competition is through the roof. What’s the answer then? Should you exhaust yourself trying to rank for high volume keywords? No, absolutely not. Instead, you should be focusing on long tail keywords. These have less search volume, but also have less competition and much higher conversion rates. Today I’ll share a step-by-step guide to finding and implementing these longer tail keywords into your content for huge results. Long tail keywords are keyword phrases or search queries that are extremely specific. They usually consist of three words or more. Long tail keywords are vital to your success, as they are used by customers who have done their research and are at the stage where they want to find a product or service to purchase. As a result, these phrases tend to bring in high-quality, targeted traffic to your site. These visitors are ready to buy and it will show in your conversion rates. So, how do you find them? Well, Wordtracker is a great tool to use. 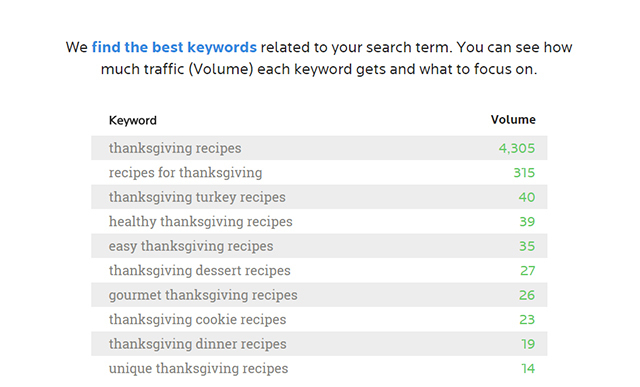 Immediately I’ve got some great options for search queries more specific than simply “thanksgiving recipes.” From here, I can delve deeper by modifying these results. For example, I may choose to add “gluten-free thanksgiving recipes” as another possible keyword. Combining these long tail keywords with other SEO strategies on your blog will maximize your traffic, conversions and everything in between. Now that we know how to find these keywords, it’s time to start implementing them into the content itself. Long tail keywords aren’t anything new but more and more of the world’s top companies are using them because they get results. 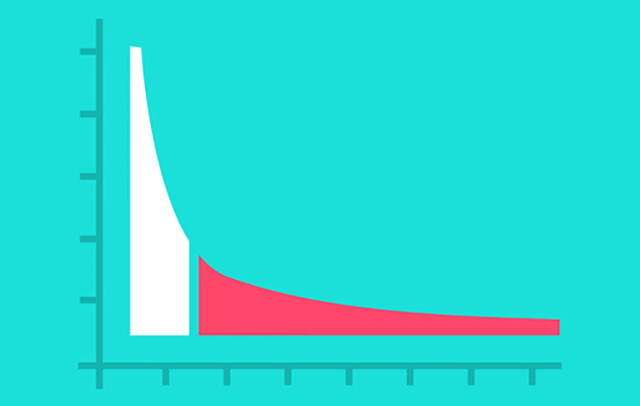 Amazon, for example, makes 57% of their sales from long tail keywords. At this point, you’ve probably gathered a long list of keywords you want to start using. Keeping this in mind, you should structure your posts around specific long tail keywords and maintain a focus on that subject throughout. Don’t try to write about multiple subjects at one, choose one and hone in on it by using your main keyword as the basis for the topic. Once you’ve defined your purpose, you can produce content that naturally incorporates your newfound keywords into each and every post. The easiest way to understand your audience is to create buyer personas. This allows you to form an image of your typical customer in a way that describes their needs, goals and values. Doing this helps you understand how your content can be used to solve their problems and address their wants and pain points. You can mix and match these, but the goal here is to find out what makes your readers tick. This exercise will give you a quick fact-sheet to reference when you’re planning new content. Remember, all of your content should provide value for your audience. Now that we’ve defined the purpose and intent, and identified the audience that will be reading our content, it’s time to start using those long tail keywords. Let’s start with your headline. Remember that people who are searching these types of keywords are on the cusp of making a purchasing decision. Your headline should speak to their motivations and captivate them immediately. It’s not enough simply to input the keyword into your headline and call it a day though, you need to try and emulate viral blog post headlines. The biggest obstacle people face on Thanksgiving is fighting the urge to eat the unhealthy, massive meals that come with the holiday. By using the term “guilt-free”, we're showing them that these recipes are going to remove that emotional stress by providing them with healthy alternatives. Once you’ve nailed the headline, it’s time to start writing. The introduction should be an extension of the urgency created in the headline. This is also where you’ll implement your main long tail keyword to set the tone for the rest of the post. Throughout the post, keep your reader’s intent in mind. Remember why they are here and what they are expecting. As you move into your post, integrate related keywords and phrases naturally into sentences. If they stand out as not really belonging there, it will break your reader’s immersion. Keep this focus when writing your subheaders as well. Remember that each section should continue to elaborate and provide additional content related to your initial promise in the headline. Finding long tail keywords is easy once you know how to do it. Using them in your content requires careful planning, and a keen understanding of your readers and the intent they have when they search for the phrase you’re targeting. Remember always to provide value and your content will shine. What tips would you offer for long tail keyword research and implementing them into your content? Share your thoughts in the comments below!